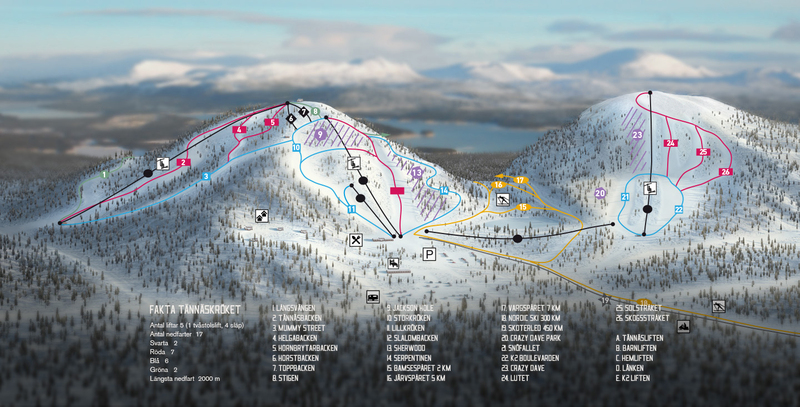 Alexander Blomqvist is the new site manager for Tännäskröket’s Ski Resort in Funäsfjällen. Alexander is now busy preparing this year’s season with the goal of offering skiing and cosiness for the whole family. -I long for the cold and to scrape the snow of the windshield every morning, says Alexander. Alexander is born and raised in Östersund and has worked with several ski resorts in Sweden and the U.S. He has also been the site manager for Lidingöbacken and Ekebyhovsbacken. This season’s goal is to keep developing the resort and to offer a ski experience of the outmost quality. Alexander wants to work with the staff to bring out the familiarity and cosiness that is the hallmark of Tännäskröket. -We will continue developing off pist skiing, which as it is is already top notch. We want to offer a whole spectrum of experiences for beginners as well as advanced skiers. -I want the whole staff to really love their job and look forward to coming to work every morning, says Alexander and states that a dedicated staff is crucial to making the guests comfortable. Stort fokus läggs på familjerna som besöker Tännäskröket. Vi vill skapa en anläggning full av barnaktiviteter där vår fäbodvall och de levande djuren kommer att förstärka vildmarkskänslan. Varje aktivitet anpassas så att hela familjen kan delta. At Tännäskröket, we focus on family. We want to create a resort where you can be comfortable while still experiencing the wilderness. This year, restaurant Árran offers something out of the ordinary. -It feels great to be able to offer a dining experience like this, says Alexander, who has initiated a joint project with Chef of the Year Tomas Diederichsen. The food draws inspiration from traditional Swedish as well as Sami cuisine. When you book the our X-mas smorgasbord you will get 10% off on accommodation. We offer a great holiday week with food cooked by Chef of the Year 2011. Accommodation in a four bed apartment and ski pass and X-mas dinner at restaurant Árran. Celebrate the holidays and enjoy a Sami New Year’s dinner! Package includes accommodation in a ski in ski out apartment, New Year’s supper and ski pass. Call us at +46 684 24 000 or mail us at bokning@tannaskroket.se. The winter of 2012 Tännäskröket will open a new restaurant in co-operation with chef of the year Tomas Diederichsen. The restaurant will be called Árran, which means fire in Sami. Focusing on game, the ambition is to rediscover forgotten traditions and use the fantastic foodstuffs of Northern Sweden. Árran opens December 23 for lunch and dinner. Romantic Weekend or a Weekend with the lads? Weeks 2 to 6 and 11 and 12 we offer an extended weekend (thursday through sunday) and what we call a “short week” (sunday through thursday). This applies to all our mountain cabins and apartments.